The hotel Wolfinger is a converted nunnery. The room is pretty spacious and has recently been renovated with a beautiful wood floor and a walk in shower with no lip at all. Every one of the hotels at which we have stayed in Austria has been at least 500 years old. We also have just realized that we haven't turned on a TV since we left Canada. We walked out into the Hauptplatz this morning to find that everything was very quiet. We then checked the tram timetables and surmised that this is a Public Holiday. Not really an inconvenience but the public transit is less frequent and many restaurants are closed. We took the bus out to the Botanical Gardens set on a hillside with views over the town. This is very well done indeed. The plantings are done with a view not only to displaying the plants but to blend them in to their setting. The greenhouses are very interesting with displays of orchids, cactus and tropical plants. The open air gardens are excellent and the flowers are blooming in profusion. There are several formal gardens, including one with a pool containing turtles. There are also several areas devoted to plants from different parts of the world, North America, Asia for example. The plants are set out so thickly that weeds find it difficult to take root. The gardens boast one of the largest collection of cacti in Europe and there are over 10,000 different species. The plan which is in the pamphlet clearly marks the various areas and makes it easy to plan a route through. The city is justly proud of its botanical gardens. We took advantage of the sparsity of the bus service to see a new part by returning back through the Hauptbahnhof and then taking the tram. We then split up with Mary going to the Museum of Modern Art while I went to the Postlingbergbahn Museum which was open today because it is a holiday. I was the only visitor at the time and the young lady pounced upon me and insisted that I go into the car barn which is normally locked so that I could see the open toast-rack car they have. 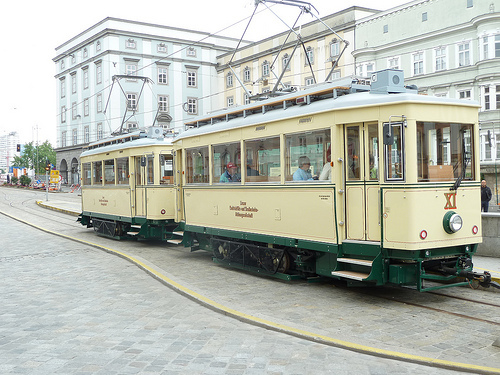 The Postlingberg line was built to meter gauge so that the cars could handle the gradients better (the Linz city trams run on 900 mm gauge). 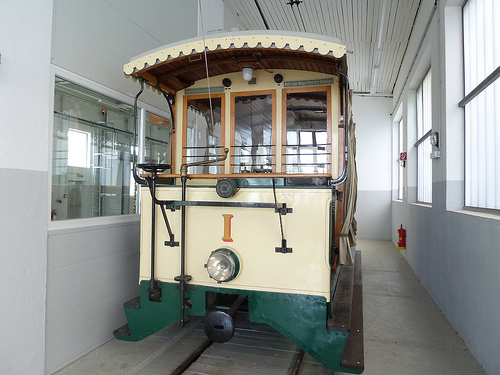 The cars had special brakes, electric and mechanical as well as an emergency brake which clamped on to the rail and could not be released except by prizing it away from the rail. The original cars were double flanged and special switches were required. In 2008 the line was completely relaid with meter gauge track and three new three-section cars provided (501 - 502 - 503). A fourth car has been provided but it is still undergoing trials. 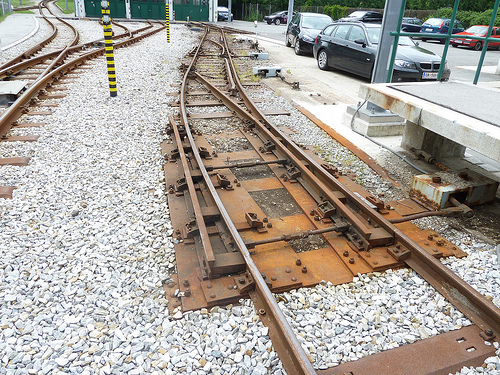 Only two of the original 900 mm gauge cars remain at Linz, these are on a separate track which just runs from the barn into the old station. The line is energized and both remaining cars are in fine shape and operate. 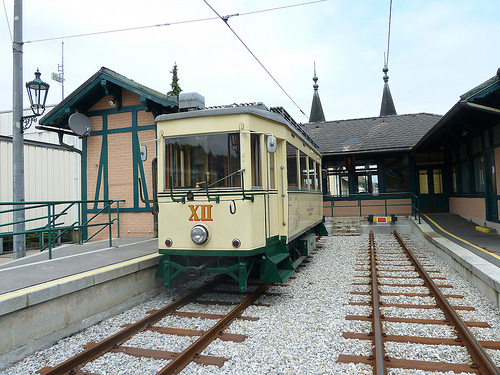 A third meter gauge car has been lent to Gmuden where is is used on special occasions, There are two old style four-wheel cars in use on the Postlingberg line but these are, in effect, new cars rather than original cars which have been regauged and upgraded. It was a thoroughly entertaining visit and the young lady was happy to have someone to talk to. I walked back past the OBB Linz Urfahr station which uses diesels and has a sparse service and caught a tram to the end of the line at Universitat and then back to the Hauptplatz. We thought we might have to have ice cream for the main meal today but we found an open restaurant just off the tram route. The food came pretty quickly and was very good even if the kitchen only seemed to know how to cook breaded meat or fish.